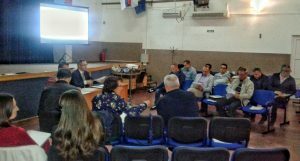 The constituent meeting of the Economic council of Prnjavor municipality was held on 28 September 2017. The Economic council consists of nineteen representatives of the public and private sector of the municipality. The Rules of Procedure of the Economic council were adopted and concrete initiatives for improvement of the business environment were proposed. The project “Partnership for quality jobs and competitiveness” and the initiative for establishment of the Employment Council of Prnjavor municipality was presented, which represents the capacity for continuous harmonization of supply and demand of the labor market in Prnjavor.